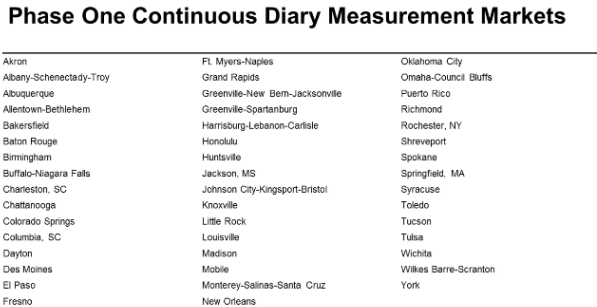 Nielsen revealed on Thursday how it would change the measurement of over 200 small and medium markets measured with the Audio Diary from a quarterly (or 2X times a year static view) to monthly reporting. The move is an effort to align both Radio and TV reporting periods. Continuous Diary Measurement will be released in three stages with the first phase beginning in mid-2019 in the 47 Arbitrends markets measured four times a year. The goal is to produce continuous diary measurement with year round measurement and monthly reporting. All markets will eventually have 12 currency releases a year, expanding from current 2X and 4X per year reporting with a 1000 minimum in-tab target for currency. For the current 47 Arbitrends markets measured 4X per year, the changes will begin with the May-June-July 2019 survey period. When combined with PPM, markets representing 70% of the ad spending will then have monthly reporting. Nielsen says these moves will make the results more timely by making currency "current" with the ability to react faster to market changes for more impactful schedules. Plus it helps to align media measures with common report periods for Radio, TV and Digital. Improved stability is also achieved with rolling monthly samples and a 1,000 in-tab minimum for currency reports.